Fish soup is a bowl of warmth to have after emerging from your cold office during lunch break. It’s a change from having jook (congee) every day when you’re sick with a sore throat. You know if you’ll be back for it if you like the fish, the broth, or both. But sometimes, what elevates a fish soup as a gem are the non-essential ingredients or that explosive chilli on the side. If you’re combing through Ubi for it, look no further than Bing Garden Eating House near Ubi MRT Station. Spot the longest queue in the coffee shop during lunch hour and you’ll find Tai Seng Fish Soup. From S$4.50 and up, you can get your fish soup fix with fried or boiled fish slices, or choose between seafood and tom yam soup. There’s porridge and yee mee, bee hoon, and mee sua too if you’re reconsidering having rice. Their standard bowl has cabbage, fried egg floss, shallots, and Ikan Bilis to enhance its taste. Tip: Ask for more crushed ti por (fried sole fish) like many of their other customers do. Be sure to give your fish soup a good mix because their ti por is at the bottom of the bowl. We tried their Fish Soup (S$4.50) and the light soup was sweetish and deep with fish bone flavour. Its milkiness doesn’t come from the evaporated milk but from the collagen and gelatine of boiled fish bones plus a touch of rock sugar. Their slices of batang fish (or Spanish Mackerel) are firm and bouncy. 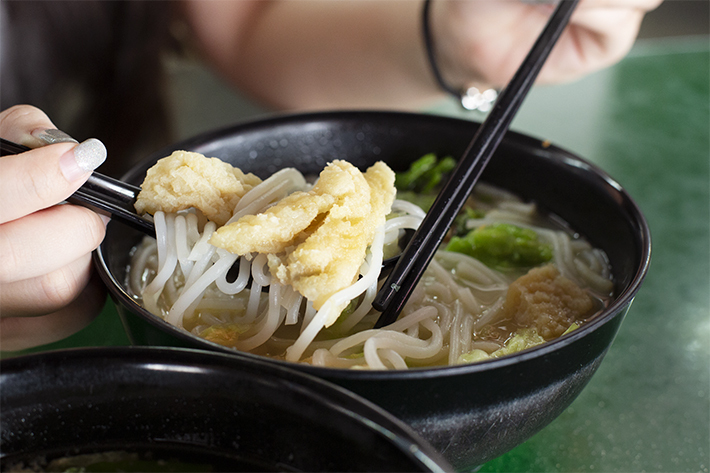 We had Fried Fish Bee Hoon (S$4.50) but choose fresh over fried fillets if you want untainted goodness. Otherwise, consider ordering fish belly soup at S$7 or get it as an add-on for an extra S$1.50. The fish is good to enjoy on its own but their house-made chilli sauce is an explosion of spiciness that burns in the back of your throat. It’s mixed with lime, giving it an appetisingly tangy heat. They regularly update their Facebook for closure days so do check that out before you drop by!